This week, the Earth Odyssey mobile village came together for (what we called) a Re-Visioning Retreat with the goal of having the group co-create a new mission, vision, identifying core values, goals and solidifying our next steps for sustainability projects. We’re doing the work that we feel the world needs to be doing. We believe that before this world can truly repair our relationships with the earth, we need to repair our relationship with ourselves and each other. Repairing our relationships with each other through engaging exercises that allow for the creation of a conscious collective intention. We facilitated a collective understanding that weaved our personal motivations and passions for this bus tour together. It began with processing our own emotions and holding a space to clear them but taking note of everyone’s disharmonies to find solutions and ended with harmony and a re-inspiration for the rest of the Earth Odyssey! The process we followed is called Dragon Dreaming. Dragon Dreaming has four steps: Dreaming, Planning, Doing and Celebrating. The dreaming stage is the path from the individual to a collective vision. In the “dreaming” stage we tell others about our dream, and then “let it die” in order for it to be reborn as the collective dream of the whole team. It is only after this that everyone can identify with the idea and will commit to it one hundred percent. In the planning stage we consider alternatives, develop strategies and test the project in various ways and aims to facilitate the emergence of collective intelligence. The doing stage is the path to practical implementation, which is taking your dreaming and planning to action. No project or process is complete without a recognition and celebration of its success. The celebration stage is something much forgotten and under appreciated. This stage is vital to avoid burnout and is the conscious appreciation of everything that has been accomplished and what has been learned (from each other). Celebration also stimulates a new awareness: What we have learned will lead to a new understanding of ourselves, the people around us and the world. 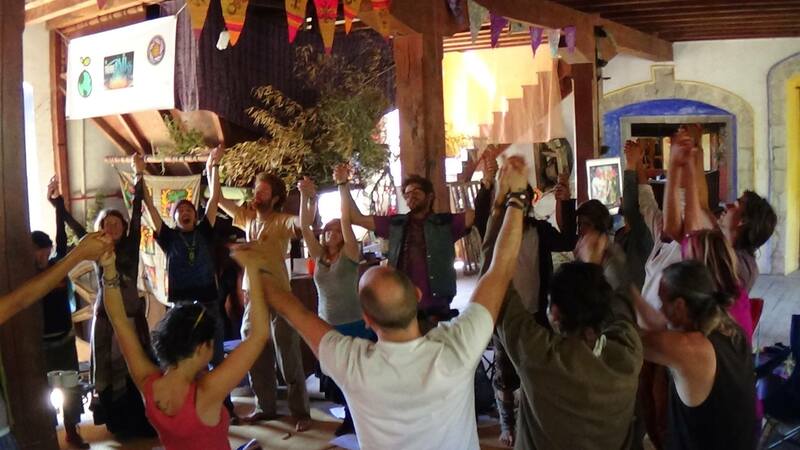 The first day began with a gratitude and forgiveness meditation led by our permaculture-yogi, Angie Gonzales. This exercise brought us into a clear state and a clean slate from the previous day of letting our deepest emotions out to the group. We continued with a Visioning exercise led by Ivan and I with the goal of creating a new collective vision for the tour. I led the group through a meditation that allowed people to put themselves in future tense as if the tour had already finished. I presented questions like “With your expectations exceeded and your heart completely fulfilled, what does that look like?”, “What is the intention that you have fulfilled?” and “Who are you working with? What kinds of people? Which places have you visited? Who have you impacted?”. After the group could fully visualize the journey and outcome, everyone (stream of consciously) wrote two word phrases on notecards and then combined them in a big collage. At the end of the retreat we revisited the collage. Next in the dreaming phase came the Core Values exercise led by Ivan. This exercise was modeled after a section in Starhawk’s Empowerment Manual. Each person in the group chose two core values to put into a master list, then each of us selected seven that we liked the best. From there, we were able to choose the top nine values that encompassed. Our eco-caravan weaves a nuevo mundo network by co-creating, sharing and empowering regeneratively holistic systems of living together. This phase included a day of Open Space which was break-out group sessions led by people who felt inspired by a particular proposed topic or project. We broke out into groups that planned specific sustainability projects around Lake Atitlan, re-envisioned the leadership and decision making structure, exploring fundraising ideas and a new social media strategy. This process couldn’t have gone better. The right people showed up to the different sessions who felt inspired by each topic and the developments were spectacular. The next day each leader of the topics clearly presented their proposals to the group. We were presented with detailed project proposals with budgets, timeline and mission, a new holacracy based leadership structure, new fundraising ideas and an engaging social media plan! The outcome allowed each project proposal to pass and new leaders and teams were empowered to emerge to spearhead the projects. Kamajachel is community of women who wish to bring back and to preserve the ancient practice of natural dyes in order to color the textiles that decorate the diverse pieces that decorate the bodies of many including native people, tourist and others who admire this intricate art of dyeing and weaving. This project supported by members of the Earth Odyssey of Project Nuevo Mundo will implement a natural dye garden that intends to opens the doors to visitors and to serve as an educational experience for those who come to witness the process of picking the fresh plants and then “cooking with colors” to bring weaved traditional clothing to life. Guided tours of the garden will also serve the women as a way to empower themselves with an added source of income and financial independence. Konojel is a Nutrition Center serving 60 free meals a day to children and elderly in the impoverished barrio above San Marcos. PNM’s Earth Odyssey is designing and building a solar cooker and solar dehydrator while teaching how to build and use them. This project is aimed at the creation of regenerative livelihoods in the community while providing healthy food and education programs. Chacaya is a school near Santiago, also on Lake Atitlan, where PNM has facilitated a ‘sister school’ program for ongoing supportive development. A project team headed up by the team of natural builders in the caravan is the first iteration of a long-term alignment to build new classrooms. One of the project presentation proposals after our open space sessions! We celebrated with a beautiful drum and song ceremony in our tipi led by our elder in the group, Donnie. We sent prayers and intentions into the cosmos and reflected on our visions and intentions created during the week. It was a powerful evening with lots of good lessons taught to us by Donnie’s ancient wisdom. Grateful for the space to heal and pray, the celebration phase was complete! Since this nine-hour a day, four-day intense Re-Envisioning Retreat, our Earth Odyssey structure has been harmonic, and thriving. Each member of the mobile village is re-invigorated to share their gifts and activate impactful projects all around Lake Atitlan. The theme of the week was “Trust the Process” because we realize it’s not about the destination, it’s the journey and the shared experience. We are not running or rushing the outcome, we’re paying attention to what develops in that process. Since we value conversation and interaction, we’re not stressed about the outcome. We’re welcoming the development of what emerges, which is a great lesson for life. The process was challenging but allowed us to do deep work that we now know should have happened long before the tour began! Practicing our daily meeting to see off a few Econauts who are going off to work on projects in El Salvador!